The Chicago Swordplay Guild utilizes a ranking system based on the medieval academic system, formalized around the 14th century. This system, in several variations, was ultimately adopted by the historical fencing guilds of England, France, Germany, Italy, and Spain. 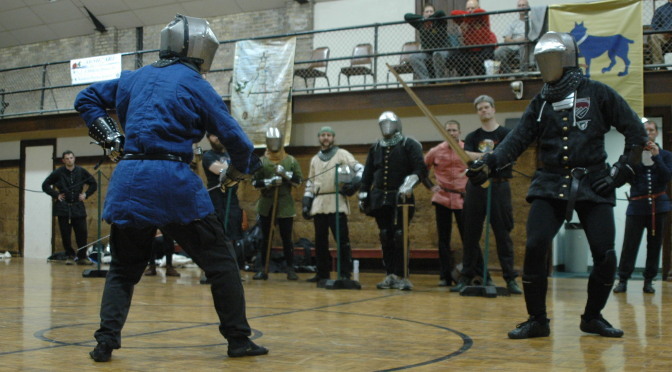 A similar structure of ranking is used by a few other organizations, including The Academy of European Medieval Martial Arts, in Toronto, Ontario, The Black Falcon School of Arms in Colorado Springs, Colorado, The Company of Maisters in London, England, The Rocky Mountain Swordplay Guild in Denver, Colorado, and The Stoccata School of Defence, in Sydney, Australia. Ranking historically included four (4) distinct levels: scholar, free scholar, provost, and master. These grades reflected a junior and senior level of two different roles within the school of arms: that of student and teacher. The word scholar is derived from a Latin word schola (school), and simply denotes someone studying an academic subject. In the English tradition a second grade of free scholar denoted a senior student who had grasped enough of the basics to move on to more advanced training. An analogy can be found in the modern academic system, with a scholar being equivalent to an undergraduate, and a free scholar similar to a graduate student. A free scholar might not progress any further within the fencing school, due to ability, time constraints, or choice. Particularly dedicated students might press on to the grade of provost. This was the lesser teaching grade: a provost was licensed to teach students, but only under the auspices of a master, who oversaw all advancement testing. A master at arms or master of defence was the highest rank, and referred to a swordsman who had attained a high level of both martial and teaching skill. They were able to maintain their own schools and promote their own students. The Guild does not promote to this rank. One of the most important steps in the progression from the grade of scholar to master is the concept of prize playing. This is the western equivalent to the promotion testing of Asian martial arts systems. The “play for the prize” is comprised of two steps. The first step occurs as an internal event, comprised of written and physical tests to assess the student’s skills. The second step is for the student to submit a challenge for a public prize playing (free fencing exhibition), for the grade being tested for. Note that the purpose of the four grades is first and foremost to develop competent historical swordsmanship instructors, and secondly, to systematically organize curriculum and provide students with a benchmark of their progress. It is not a detailed ranking system, like those found in modern karate or tae kwon do, and progression through the grades is a slow process of years. The grades are described below. This is not an actual grade, but simply denotes a newcomer interested in the Guild. Newcomers must begin with one of the Guild’s introductory courses (Italian Longsword or Italian Rapier) before joining the Guild proper. Be a paid member of the Chicago Swordplay Guild (CSG) in good standing. Successfully complete of one of the CSG introductory 12-week courses (offered off-site). Further refine the respective novice curriculum (longsword or rapier) and add basic unarmed core-mechanic and unarmed vs. dagger defenses. Own minimum equipment requirements, as listed for each weapon. This scholar’s test has a written and physical skills component, followed by an abbreviated prize playing of three, three-minute matches against three different CSG scholars. Since the goal at this level is competence, not proficiency, most dedicated students should find it possible to advance as full scholars in the Guild. Free scholars are the Guild’s senior students and assistant instructors. They are expected to be able to teach the introductory classes and assist in teaching the scholars’ classes. As part of their support of the Guild’s academic mission, free scholar candidates are expected to adopt a research project on an advanced topic and bring that knowledge back into the Guild. This could mean any armed or unarmed western martial art in use through the 19th century. Free scholars are expected to introduce their research to the Guild membership and are strongly encouraged, when the material is sufficiently developed, to begin to carry it outside of the school and into the martial arts community at-large. In the absence of a Master at Arms, provosts function as the Guild’s senior instructors and are charged with the responsibility of bringing students through the Guild’s core material, while constantly refining the curriculum. Provosts must carry their work beyond the boundaries of the Guild and work to build the western martial arts community as a whole.